April 8, 2012, Pittsburgh, PA – Prom and graduation celebrations are just around the corner for many local students, but these gatherings meant to celebrate bright futures can end tragically when drinking and driving is involved. The Edgar Snyder Save A Life Tour kicks off this month in an effort to educate high school students about the frightening consequences of getting behind the wheel drunk. This April, the Edgar Snyder Save A Life Tour will visit five local high schools to present an experiential DUI education program for high school seniors. Thousands of students will come face-to-face with the aftermath of drunk driving accidents that affect nearly 12,000 victims in Pennsylvania every year. Following a graphic video and personal testimony, students will have a chance to "drive" a multi-million dollar DUI simulator—the same one used to train pilots and military personnel worldwide. The DUI simulator's interior resembles a Ford Taurus and reacts differently to each student based on size and weight, enabling students to feel like they're actually driving a car. Students will navigate a virtual landscape filled with various environments and road conditions. They will be able to see their control of the vehicle and reaction time change as their level of impairment increases. "We're passionate about drinking and driving prevention, so this program hits close to home for us," said Attorney Edgar Snyder, whose law firm has helped hundreds of victims of drunk driving accidents. "We're proud to sponsor this program because we know that students come away with a very real sense of the dangers of drinking and driving." Statistics show that teens are particularly at risk for drinking and driving accidents. According to a 2011 National Highway and Traffic Safety Administration survey, 16- to 20-year-olds account for 26% of all drunk driving deaths. Edgar Snyder & Associates is a law firm representing injury victims and people with disabilities with offices in Altoona, Ebensburg, Erie, Johnstown, and Pittsburgh. 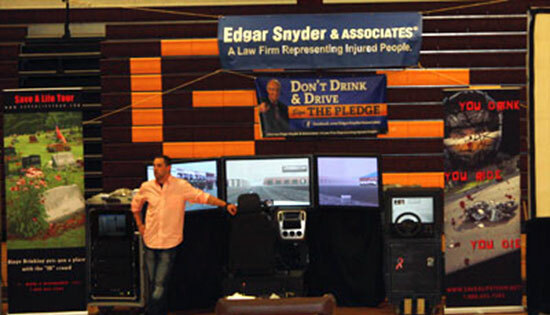 As part of the firm's mission to reduce drunk driving accidents, Edgar Snyder & Associates encourages the public to sign its Safe & Sober pledge at edgarsnyder.com/pledge. High schools interested in bringing the Edgar Snyder Save a Life Tour to their students should contact the law firm's Marketing Department at 1-800-9-4EDGAR (1-800-943-3427), ext. 4412.